Sebastian Vettel said he missed having Michael Schumacher's advice over his decision to join Ferrari from Red Bull. The 27-year-old German - who won his first race for Ferrari in Malaysia - said joining Schumacher's former team was the "hardest decision of my life". Schumacher is being rehabilitated at home after suffering a severe brain injury in a 2013 skiing accident. "Because the decision was so difficult, I would have loved to have spoken to Michael," he told the Daily Telegraph. Four-time world champion Vettel paid tribute to his fellow German and childhood hero following his "dream" win in Sepang, but will start Sunday's Chinese Grand Prix from third on the grid behind the Mercedes of Lewis Hamilton and Nico Rosberg. After four consecutive titles with Red Bull from 2010-2013, Vettel decided to leave after a difficult 2014 in which he was out-paced by team-mate Daniel Ricciardo. 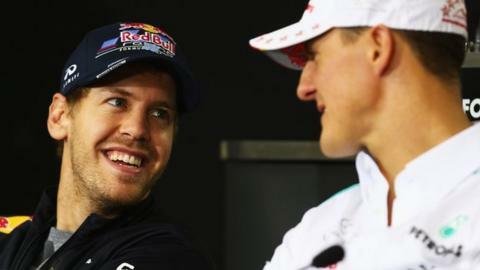 "I had spoken to him about it many times before," said Vettel of Schumacher. "Sometime it was joking, sometimes it was serious. "I think I missed that part a lot, simply because I knew he would tell me the truth of what he thinks. The honesty he had in giving me advice over the years is probably the most special thing about it."